(by Ju-min Park and Jack Kim, Reuters) | SEOUL — North Korea conducted its fifth and biggest nuclear test on Friday and said it had mastered the ability to mount a warhead on a ballistic missile, ratcheting up a threat that its rivals and the United Nations have been powerless to contain. The blast, on the 68th anniversary of North Korea’s founding, was more powerful than the bomb dropped on Hiroshima, according to some estimates, and drew condemnation from the United States as well as China, Pyongyang’s main ally. Diplomats said the United Nations Security Council would discuss the test at a closed-door meeting on Friday, at the request of the United States, Japan and South Korea. South Korean President Park Geun-hye, in Laos after a summit of Asian leaders, said Kim was showing “maniacal recklessness” in completely ignoring the world’s call to abandon his pursuit of nuclear weapons. U.S. President Barack Obama, aboard Air Force One on his way home from Laos, said the test would be met with “serious consequences,” and held talks with Park and with Japanese Prime Minister Shinzo Abe, the White House said. There were further robust condemnations from Russia, the European Union, NATO, Germany and Britain. It said the test proved North Korea was capable of mounting a nuclear warhead on a medium-range ballistic missile, which it last tested on Monday when Obama and other world leaders were gathered in China for [this year’s] G20 summit. North Korea has been testing different types of missiles at an unprecedented rate this year, and the capability to mount a nuclear warhead on a missile is especially worrisome for its neighbors South Korea and Japan. “The standardization of the nuclear warhead will enable the DPRK [North Korea] to produce at will and as many as it wants a variety of smaller, lighter and diversified nuclear warheads of higher strike power,” North Korea’s KCNA news agency said…. It was not clear whether Pyongyang had notified Beijing or Moscow of its planned nuclear test. Senior officials from Pyongyang were in both capitals this week. Chinese Foreign Ministry spokeswoman Hua Chunying said she had no information to provide when asked if China had advance warning of the test, and would not [say] whether China would support tougher sanctions against its neighbor. Although Beijing has criticized North Korea’s nuclear and missile tests, it has repeatedly expressed anger since the United States and South Korea decided in July to deploy the Terminal High Altitude Area Defense (THAAD) anti-missile system in South Korea. China calls THAAD a threat to its own security and will do nothing to bring North Korea back to the negotiating table on its nuclear program. 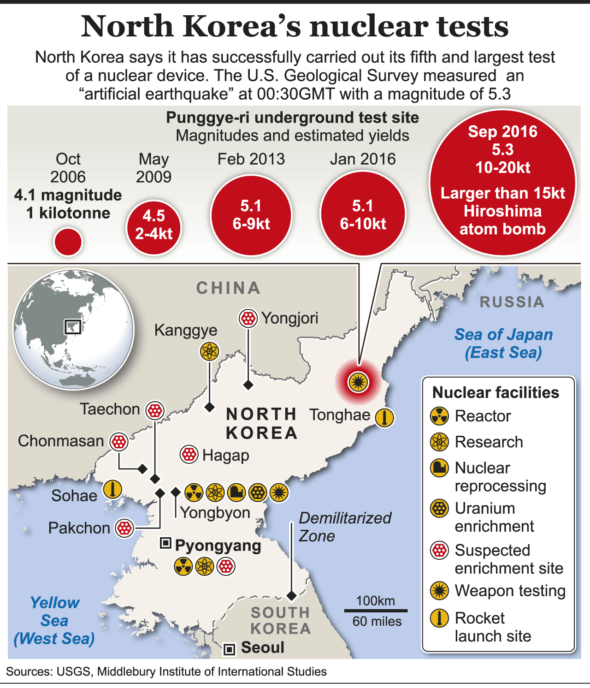 Preliminary data collected by the Vienna-based Comprehensive Nuclear-Test-Ban Treaty Organization (CTBTO), which monitors nuclear tests around the world, indicates the magnitude – around 5 – of the seismic event detected in North Korea on Friday was greater than a previous one in January. Jeffrey Lewis of the California-based Middlebury Institute of International Studies said the highest estimates of seismic magnitude suggested this was North Korea’s most powerful nuclear test so far. He said the seismic magnitude and surface level indicated a blast with a 20- to 30-kilotonne yield. Such a yield would make this test larger than the nuclear bomb dropped by the United States on the Japanese city of Hiroshima in World War Two. “That’s the largest DPRK test to date, 20-30kt, at least. Not a happy day,” Lewis told Reuters. South Korea’s military put the force of the blast at 10 kilotons, which would still be the North’s most powerful nuclear blast to date. “The important thing is, that five tests in, they now have a lot of nuclear test experience. They aren’t a backwards state any more,” Lewis said. 2. The name of the capital city of a country is used to refer to that country’s government: “Washington” refers to the Obama administration; “Moscow” for Vladimir Putin’s government; “Beijing” for the Chinese government. How do the reporters refer to the North Korean government? 3. a) How did the U.S. and South Korea, named by Kim Jong Un as North Korea’s main enemies, respond to the test? b) What response did other leaders and groups have to North Korea’s test? 4. What did North Korea say about the test? 5. a) What words do the reporters use to describe the test in relation to President Obama and for the new president as well? b) Do you think these words are an apt description should North Korea’s ambitions prove successful? Explain your answer. a) In February, CNN reported: “According to multiple experts, North Korea has at least a dozen and perhaps as many as 100 nuclear weapons, though at present it lacks sophisticated delivery mechanisms.” In this Reuters article, the reporters characterize the U.S., South Korea, Japan, the UN… as “powerless to contain” North Korea’s nuclear weapons program. They quote a Japanese professor as saying the sanctions aimed to put pressure on North Korea “have reached their limits.” Ask a parent if he/she thinks we are powerless to contain North Korea’s nuke program, or if anything can be done to stop North Korea. 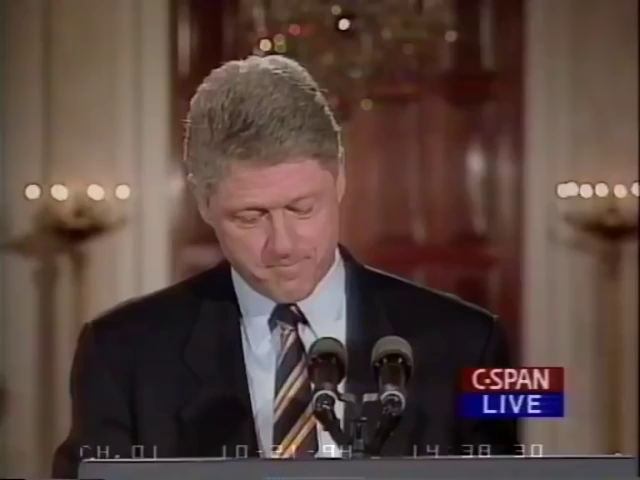 Do you think President Obama’s 2015 deal with Iran in which he dropped sanctions against the country and sent the government $400 million in cash on an unmarked plane (that the U.S. owed it from the 1970s) will be more successful in preventing Iran from obtaining nuclear weapons? Explain your answer. After failing in the Korean War (1950-53) to conquer the U.S.-backed South Korea (Republic of Korea – ROK) by force, North Korea (DPRK), under its founder President Kim Il Sung, adopted a policy of ostensible diplomatic and economic “self-reliance” as a check against excessive Soviet or Communist Chinese influence. North Korea demonized the U.S. as the ultimate threat to its social system through state-funded propaganda, and molded political, economic, and military policies around the core ideological objective of eventual unification of Korea under Pyongyang’s control. Kim Il Sung’s son, [dictator] Kim Jong Il, was officially designated as his father’s successor in 1980, assuming a growing political and managerial role until the elder Kim’s death in 1994. 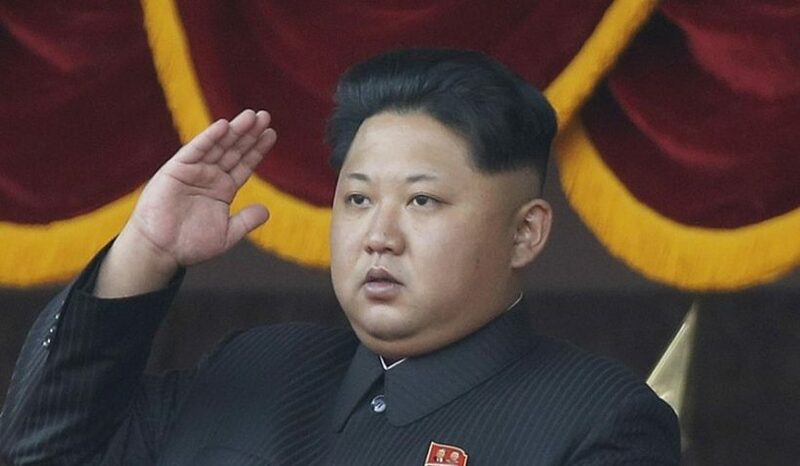 Kim Jong Un was publicly unveiled as his father’s successor in September 2010. North Korea’s history of regional military provocations; proliferation of military-related items; WMD programs including tests of nuclear devices in 2006, 2009, and 2013 (long-range missile development; as well as its nuclear, chemical, and biological weapons programs) and massive conventional armed forces – are of major concern to the international community.